Nice summary, thanks. When I want to take a look at a content of rpm, I usually use Midnight Commander (mc). It knows how to open rpm files; they look like directories and mc allows you to not only to browse cpio archives, but also pre/postinstall scripts, changelogs etc. Good compilation. Maybe usefull when you’re on a system where you don’t have your favorite tools, but, IMHO, the easiest way to access these things is Midnight Commander (at least for rpm’s, deb’s and tgz). You can use 7zip to uncompress an MSI Package. I have not found a way for this yet. will actually extract all the files from the RPM and place it in the current working directory. File newconfig.set is available in /tmp/usr/src/examples/set-5.10.0/ex/newconfig.set. What is diff between rpm and deb packages ? 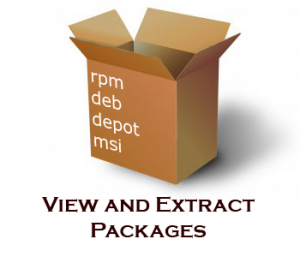 How i make deb and rpm packages if i have make a software ? Nice article thanks. I searched for the dpkg -x. On Windows, Orca allows to explore/edit MSI packages, so it is a bit more than just a way to extract files. Orca is part of the Windows SDK. I’ve installed kbox on android. On dpkg,I can’t see options you wrote,but I can see those options on dpkg-deb . But,I can’t extract it if that file has symlink,for example: ./data/dalvik-cache to /android_root/data/dalvik-cache . If only to view deb file,we can use ZArchiver on android.